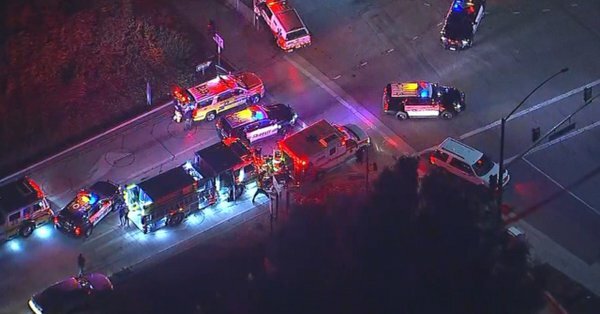 A shooting at a bar in Thousand Oaks has left at least one person feared dead and multiple people injured. Reports coming input the number of those wounded at anywhere between 11 to 20. The latest development is a sheriff’s spokesperson confirming 6 people wounded including a deputy. Details of the incident remain incomplete. The extent of the victims’ injuries has yet to be established. At least one person, however, was seen being taken out on a stretcher and placed inside a waiting ambulance. Another footage showed paramedics performing CPR on a person who appeared to be unresponsive. Ventura County Sheriff’s Deputies responded to reports of shooting at Borderline Bar and Grill around 11:30 p.m. The bar is located at 99 Rolling Oaks Drive. Multiple people were seen being led out of the establishment by the responding deputies. Reports of multiple shots fired remain unconfirmed at this point, although there have been speculations that the suspect may have been hit. Some reports say at least 30 shots were fired at the said bar. Another report says multiple witnesses claim that the suspected gunman is a Middle Eastern male. A witness, John Hedge, described the gunman as having a beard, wearing a hat, having a black jacket on, and may have been wearing glasses at that time. Hedge also said he saw the suspect threw smoke bombs in front of the bar. Reports of a deputy suffering from life-threatening injuries are still being verified, too. The bar was holding a “College Country” night at the time of the shooting. Colleges near the club are California Lutheran University and California State University, Channel Islands. Students from Pepperdine University are also said to often attend such College Country specials at the bar. An so, the liberals start the road to greater gun controls. I just restocked ammo last night.